BMO InvestorLine is the discount broker platform for the Bank of Montreal TSE:BMONYSE:BMO . BMO InvestorLine is probably the most advertised platform for investing I have seen for the past few years. They appear to be focused and committed to their platform. It is welbl reviewed by MoneySense as well. In the end though, the platform needs to meet your needs and every investor is different. For some, $6.95 per trade is more important than the convenience of having all your accounts at the same banking institutions. Be sure you know what you want and need to be a successful investor. There are two approaches to your account with BMO InvestorLine. You need to consider one of the following platform / service. BMO InvestorLine Self-Directed. This approach is similar to the other discount brokers and will be the basis for my review. You are basically on your own as an investor making all the decisions. BMO InvestorLine adviceDirect. Provides portfolio management and fees are a percentage of your account. You need a minimum of $50,000 to open this kind of account. BMO InvestorLine is not the most used discount broker by my readers as you can see below. It ranks 5th with Questrade not far behind. At first glance, the BMO website doesn’t tell me much on the features and what to expect as an investor. There is a lot of information on customer service, learning and holding your hands but the details are harder to get to. I wish there was a practice account, it’s the little features that end up making a difference in the long term for customers to make a decision. BMO InvestorLine adviceDirect is a unique proposition for investors wanting support. It’s worth walking into a branch and getting a walkthrough of the service. This is probably one of the most important criteria for everyone. I like to look at the cost of a transaction to ensure I am satisfied to invest $1,000 minimum at this cost. The basic online stock transaction will set you back $9.95. You can find all the transaction costs and fees on their website. A more detailed PDF can be found here covering all the fees. The trading fee is in line with all the other discount brokers from the big banks except for CIBC Investor Edge where a transaction fee is $6.95. High-frequency traders do not get discounts either, they instead get access extra features from the 5-Start Program. BMO InvestorLine has a 5-Star Program where your overall portfolio value gives you access to lower fees and BMO Capital Market research. Unfortunately, to get access to the research, you need at least $500K inholdings. Those interested in mutual funds, such at the BMO Monthly Income Fund, pay no fees on the transactions like most other discount brokers since fees are built in through MER (Management Expense Ratio). There are however some rules around the minimum amounts you need to invest. Be sure to read the details on the minimum for mutual fund investing. Not the lowest transaction costs. Unfortunately, there can be maintenance fees on accounts depending on the size of your holdings. You pay $50.00 annually for a RESP. You pay $100.00 annually for all other registered accounts such as RRSP. Talk about a ding on your account … For someone just starting to invest with a family, you are getting hit hard with the fees. That’s very disappointing to see those fees. I tried to see if there are fees waived when you have more products with the bank such as a mortgage and credit cards but I could not find it. DRIP stocks are limited to very small list!! Usability is a focus across all devices for BMO InvestorLine. I personally like it when the menus are on the left and all you need to do is follow from the left to the right as opposed to switching axis with your eyes. All discount brokers have to provide access to the same features in the end. You will have to learn the words used by the discount broker and remember where it’s located. It’s a little bit like the grocery store and the setup. You find similar content in all the grocery stores but the layout is usually slightly different. Moving around the interface should be easy and not a learning experience every time you want to make a transaction. I always make my trade with a limit order so you want to ensure the interface is not prone to mistakes. Hard to review this section without having access. The remaining balance on the account should be shown. Be careful that US currency, or vice-versa, is not included in the total or be aware of it as it is the case with RBC Direct Investing – I have to double check the exact value in the currency. One great feature is that you get an email notification when your order is filled. That’s a great feature that prevents you from watching the screen. In this day and age, you would expect that a discount broker can provide you with the performance of your account. It’s not clear what BMO InvestorLine has to offer here. Would love to hear what the users have to say. I personally would not stop tracking my performance on my own using a spreadsheet. See how I track my Rate of Return (or ROR) for accurate performance tracking. The first priority of a discount broker is to properly report on income tax. As it happens, I have made trades from my phone and considering everything else we do with our phone, the mobile version of the platform should be good. Mobile support is a strength with BMO Investor Line. Remember that some content is easier to see and organize on a large screen. Use the appropriate device for the work you want to do. Please note that the banks are always working on improving the interfaces and small updates may introduce changes. BMO InvestorLine has an online panel where users can share their opinion and feedback. The company appears to be listening to its customers and that’s the first step in customer service. You can also request to be contacted or call. Phone support is available 8 am to 8 pm Monday to Friday. It’s not clear if there is an internal messaging system but I must say that I have used it regularly with RBC Direct Investing and would prefer that to call. 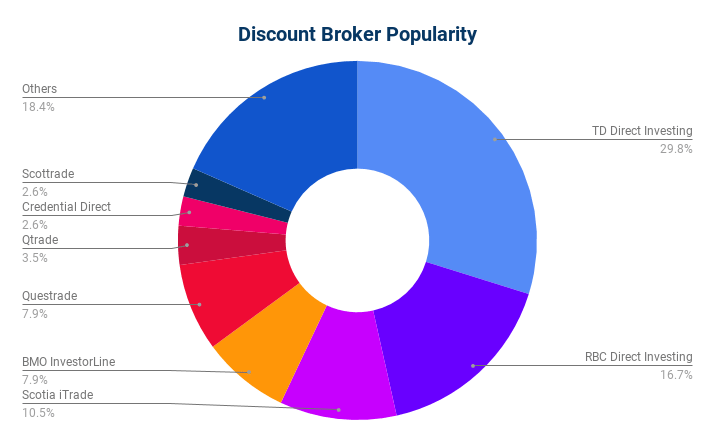 Choosing a discount broker is a personal choice and the discount broker should satisfy your requirements. If you are a seasoned investor with a decent portfolio, the fees are not concerned but if you are starting, make sure you understand the fees you may pay for each of the accounts you are interested in. If you can get access to the research and you need it for investing, BMO InvestorLine my be your preferred choice. While the easiest path to selecting a discount broker is to use the one affiliated with your bank, there are options available with different feature set and cost that may best fit your needs. Be sure to review all of your options.